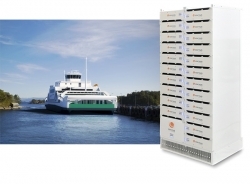 Corvus Energy has been chosen by total system integrator Norwegian Electric System (NES) to supply a lithium-ion-based energy storage system (ESS) for a new all-electric ferry being built by Fjellstrand for Norwegian ferry operator Fjord1. Fjord1 ferries are important to the transportation infrastructure along the west coast of Norway, crossing the fjords and connecting the islands to the mainland. The Fjord1 ferries and passenger boats transported 10.5 million vehicles and 21.5 million passengers in 2014. This new all-electric ferry will operate on the Halhjem-Våge route in Hordaland. Furthermore, Corvus Energy has achieved ISO 9001:2015 certification for its global operations, manufacturing and service processes. A recent audit covered ISO 9001:2008 requirements and ISO 9001:2015 transition requirements. The scope of this certification includes design, development, manufacturing and services for lithium-ion-based ESS. And finally, Corvus Energy has announced the appointment of Geir Bjørkeli as its new CEO. Bjørkeli was previously director of Norway for Dutch company Huisman, a design engineer with ship designer and shipbuilder Ulstein, and held several positions with Rolls-Royce. He succeeds outgoing CEO Andrew Morden. Nick Andrews, chairman of the board of Corvus Energy, added, “Geir has impressed us with his extensive technical and commercial experience in internationally traded industrial and offshore equipment. He has the experience and the drive needed to guide Corvus through the company’s current period of high international growth, and we are confident that he will be a strong addition to the Corvus team.